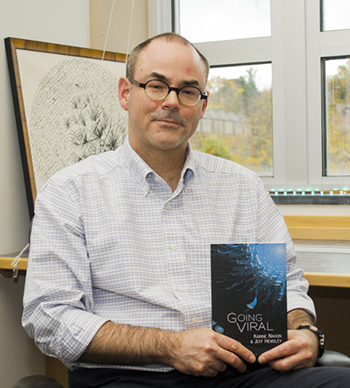 For the second time in as many months, School of Information Studies (iSchool) Assistant Professor Jeff Hemsley’s book, “Going Viral,” has been recognized with a significant award in the field of scholarly writing. The Association of College & Research Libraries has selected the book as an Outstanding Academic Title for 2014 in its January issue of Choice magazine. This prestigious list reflects the best in scholarly titles reviewed by the magazine, and brings with it the recognition of the academic library community. Choice is considered the premier source for reviews of academic books and digital resources of interest to scholars and students in higher education. The book represents years of research, as well as a synthesis of literature on the topic from the disciplines of network science, communication, information science, political communication and sociology. It provides a working definition of what constitutes a viral event, offers a more concrete perspective of the concept and distinguishes what virality means in the online media space. Hemsley co-wrote the book with Karin Nahon, associate professor at the University of Washington Information School and director of the Virality of Information (retroV) research group there. In November, Hemsley and Nahon were recognized with a Best Book award for “Going Viral” at the 2014 annual meeting of the Association of Information Science and Technology (ASIS&T). This national award recognizes outstanding books in information science. Hemsley is a founding faculty member of the iSchool’s BITS (Behavior – Information – Technology – Society) Lab, where he works with faculty and student researchers across institutions on big data collection and analysis of social media networks.